Kwaku Manu's hard work as an actor and comedian has really paid off. He has become one of the richest entertainers in the country. Gone are the days when Ghanaian actors and actresses struggled to make a living. 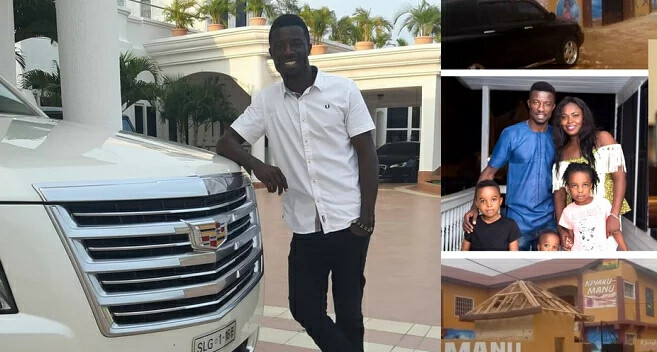 Today, there is a lot of money to be made from Ghana's movie industry, and Kumawood star, Kwaku Manu, is one of those enjoying the benefits. Kwaku Manu, who is more of a comedian than an actor, is one of the popular and most loved actors in the country. Kwaku Manu is not single (sorry ladies). He is married to a beautiful woman. And they have three children together. Here is another photo of Kwaku Manu's adorable children. The money Kwaku Manu earns from movies, endorsement deals and his private businesses help him to finance lavish vacations abroad. He has, as a result, toured several countries in Europe and America. He treats himself to the best designer wears. Kwaku Manu has also acquired several valuable property. He drives some of the best vehicles money can buy. They include saloon cars and SUVs. One of the vehicles is a Ford SUV. The actor certainly has an eye for luxury vehicles. Unlike some of his colleagues, Kwaku Manu is very smart. He has invested some of his money in several businesses. One of such businesses is a school - The Kwaku Manu Educational Centre. The school is located in Kumasi and caters for preparatory and junior high education. Here are some of the school's pupils. Here is the school from another angle. The actor also sells teaching and learning materials, including books. The actor is also involved in several other businesses and investments. Kwaku Manu is a star and YEN.com.gh wishes him all the best. Use the comments section below to share your views on this story.